Place sausage meat into a bowl with garlic and parsley. Mix well and add TABASCO® Processor’s Blend. Unroll pastry onto a board and cut in half lengthwise. 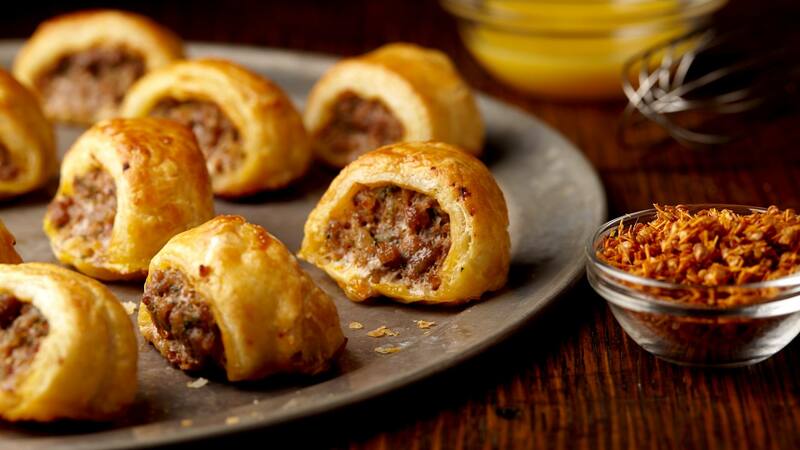 Divide sausage mixture in two and spread along the length of each pastry strip in a cylindrical shape, leaving a small edge. Tightly roll the pastry around the sausage meat and brush the ends with the beaten egg to secure. Use a sharp knife to cut each roll into 10 pieces and place on a baking sheet. Brush more egg all over the pastry. Place in the oven and cook for 25 to 35 minutes, until the pastry is puffed and crisp and the meat has cooked through. Remove and serve hot or cold.